Last week, at the tail end of my birthday vacation, I took in the Alita: Battle Angel film before it disappeared from theaters entirely. So how was it? It began when Kyla’s previous phone (an aging Moto X Pure) started going kaput in a big way. After some research, she went to Best Buy on Friday and picked up a Nokia 6.1 as a replacement. That phone’s just a smidgen more powerful than my Moto G5 Plus, which makes it a huge upgrade for her. Huzzah! Well. My phone had some issues as well and is nearing the end of active support. Plus, being a Lenovorola, it has some… quirks. So I figured, fine, let’s just get out ahead of the problem and use some of that sweet, sweet tax refund money to upgrade my own device. Saturday, while out on our grocery run, we swung by Best Buy and I nabbed a Nokia 7.1 (in blue, not that it matters because once the protective case goes on nobody’s going to see its natural color again). How am I liking it so far? Quite a bit, albeit with some getting-used-to involved because it’s a longer, narrower device than my previous two phones. Text is smaller as a consequence. There’s also that weird “notch” display element at the top, and the fingerprint sensor is on the back with almost no physical guide to tell you where to tap your finger. (Once the case I ordered arrives, finding the sensor should cease to be a problem.) The phone is definitely peppier, and with the SD card I took out of the tablet (it wasn’t being used for anything since I haven’t made any time-lapse videos in ages) I’m able to put a whole lot of music on there instead of just a few hours’ worth. Within 24 hours we went from being a fully Motorola household to a fully Nokia household, and we’re both quite pleased about that. Today, because it’s absolutely gorgeous outside, we hiked around at one of our favorite places: The Tualatin Hills Nature Park. I played stevedore, carrying around our water bottles and battery packs and the “big” camera in my backpack. The trees lack leaves as of yet so it was up to the moss and ferns and some grasses to provide greenery. We didn’t see many birds but wow, were there ever gartner snakes all over the place! They all slithered under cover as soon as we could see them, which is a shame because I really wanted a picture. 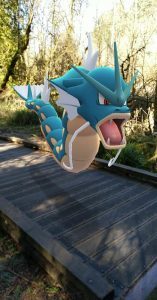 I had to settle for using the Go Snapshot feature of Pokémon Go for my “wildlife” photos. 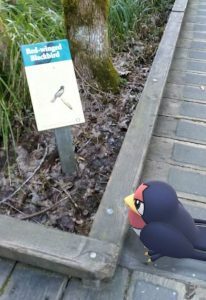 Taillow reading about his distant cousins. We also crossed the world’s smallest bridge. 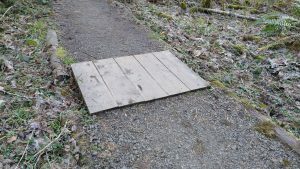 Step on, or step over? You decide. Happy Birthday to me. I’m no longer in my mid-40s, but instead must embrace the late-40s tag. Ah well. I’m starting my day with snow falling outside on the morning that I’m supposed to go see a movie, and I’ve already taken ibuprofen because I made the mistake of treating myself to a sandwich after dealing with the DMV yesterday and a bit of the hard cheap bread jammed my gum and now that spot is swollen. And I’m writing this at before 7am on a morning I could’ve slept in, but of course was unable to. May the day get better from here, everyone. Before I go looking around for an app with which to post content from my phone, I figure I should try using the built-in mobile web interface as a test. Let’s see how it works. 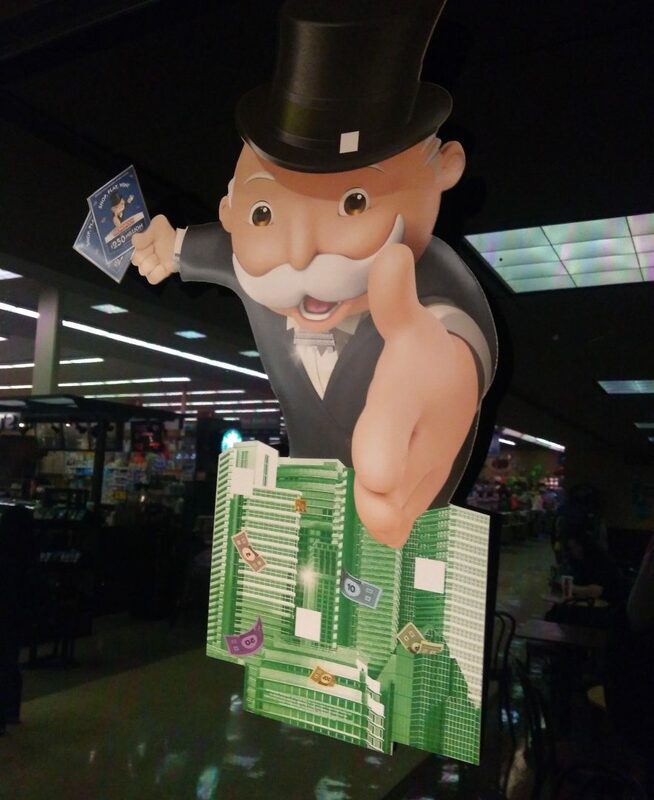 Here we see a dapper older gentleman, karate-chopping a city for its money. And I’m using the new WordPress “block editor” because what the heck. I guess this is doable. I’m not sure if I actually like it though. Ideally I should be in front of a proper computer to do any useful, long-form writing. But in a pinch? I guess it’ll do. I’m not sure how to feel about assembling LEGO doodads as a creative outlet. All I’m doing is following instructions. On the other hand, if I take a lot of photos and write a snarky blog post about it… yeah, here we go then.